Have I told you how much I love this song? Now I'm not some fanatic fan who'd love everything her superstar does, but honestly, this Yuna girl is such a God-sent. Listening to her voice makes me realize how much Malaysian artists and music industry have actually grown. She's pretty, down-to-earth, talented and fashionable. Gosh, I can't hide the fanatic fan symptoms very well, can I? OMG, that is what we call fabulous. I know I won't be caught in public wearing an outfit like that, that's why you should say "I want to be a celebrity when I grow up" when your elementary school teacher asked you because only celebrities are allowed to wear fabulous outfits like this. I like how the harem pants work on her, I love the color combo, I love the hijab style..sigh..
Go to her website to see her other amazing photos. And I guess you guys knew about the Yuna & Hana Tajima collaboration - Live Fashion/Love Music 2010 ft. Yuna and Hana Tajima. 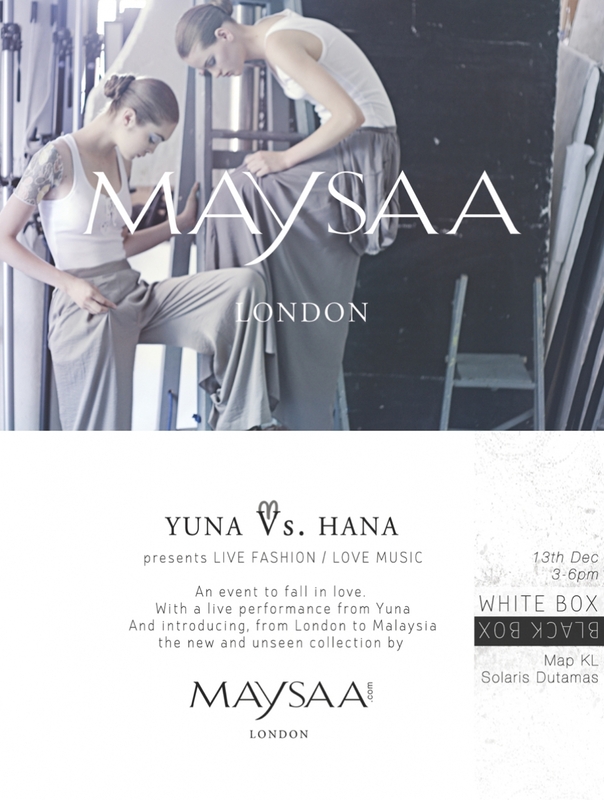 Please smack yourself if you don't, a must-known event for all Maysaa fans! I started following StyleCovered when a friend told me about the website - and it was a turning point for me. I realize that so many girls out there who are hijabis and yet very fashionable in their own way, they're making a huge impact on our society. Hana Tajima is a fashion designer, and she designs all things modest and yet very high fashion. If I have all the money (and patience) in the world, I'd buy every single piece on her website. Pfft. The event was held last 13th December so yeah, those who managed to go should count your blessings..I wish I was in Malaysia, even if it's just for one day :( The event turned out so great (based on what I read on the internet) I mean, fashion show and live music all at the same time?? It's basically what Fashion Week is missing. You can go to Sha Elaiza's blog to see what the event was like, and of course, the pictures. Simply because I love her blog. I always knew about Yuna's beautiful voice and catchy songs... but I didn't understand why she was such a huge superstar. That was until I heard her sing live yesterday. I. completely. get. it. now. @Sha Elaiza : I know! she's so amazing :)) I youtubed all her songs too, she sounds incredible live..you guys are so lucky! sighh. I've watched that video, now it's become my fav too haha. MASHALLAH THIS ARTIST IS INCREDIBLE!